This lunchbox product review is a guest post from Kiran…to learn more about Kiran check out our team page! I’ve had a pit in my stomach for the past few days. I know that for many moms, back to school is a time to celebrate … but for me, I love the ease of the days, the lack of schedules, and the absence of homework. Can’t summer stay just a bit longer? Alas, before we know it, school will be back in session. It’s high time to pick out backpacks, to select school supplies and to shop for sneakers or other suitable shoes. But let’s not forget the packing of lunches. Since we’ll want to provide our kids with the tools they need to succeed, ensuring that they are equipped with real, nutritious foods tops most of our lists. A member of the S. C. Johnson & Son, Inc. family, Ziploc has been a household name for years and years. A provider of storage solutions, their options don’t just include baggies and such; in recent years, they’ve added numerous options at reasonable price points that are offered in big box stores convenient to most and frequented by many. Popular brand Ziploc’s take on the bento box in a more affordable, everyday product. Sold in packs of two, the BPA-Free containers consist of three compartments each and a secure fitting lid. The product claims to be freezer, microwave and dishwasher safe, though precautionary statements for use are included on the package. Please note that the containers are also disposable and are not intended to last as long as more expensive containers. Ziploc Containers are readily available at most big-box stores (like Target and Supermarkets) as well as Amazon (online) and perfectly priced. I’ve been a personal fan of the Ziploc Divided Containers after Lisa turned me on to them last year. I used them for both of my school-aged girls … and to be honest, I’m not sure who loved them more – me, or them. My personal loves are that there’s only one container to wash, each of the compartments have ample room and I love that each of the compartments are individually sealed and leak-proof. As you can see in my photo, I sent fruit, a sweet potato and oatmeal (my kids don’t seem to mind if foods are warm or cold – lucky for me, right?!) I’ve sent everything from yogurt to homemade applesauce, and nothing has ever leaked to the other side – because believe me, I’d hear about it. 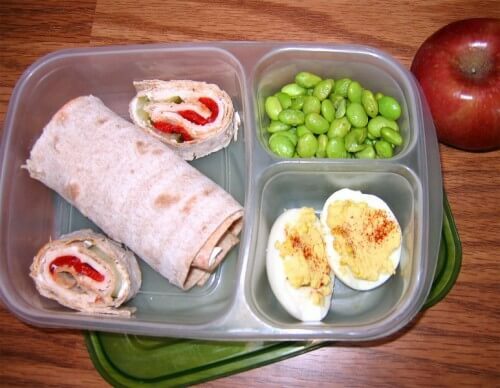 For more ideas on what to pack in these lunchboxes check out Lisa’s School Lunch Roundup post. The negatives, in my opinion: the size of the boxes is good for serving sizes but tough to accommodate in many lunch bags. I had to specifically outfit my girls with lunch bags that would fit the product (Lisa uses Lands End soft sided lunch bags to fit both a Ziploc Divided Container and Thermos cup). If you are concerned about using plastic, this product is not for you. And finally, while the price may be right, you may end up buying a few of these which could add up to the cost of one of the stainless steel options. Caroline and Robert Miros combined their working knowledge – she, whose talents lie within children’s health education and environmental programs, and he, an engineer who has designed consumer and medical products – in creating PlanetBox. The product was designed to provide an innovate solution for making lunch packing enjoyable for kids and adults alike. Their goals: flexibility, durability to withstand years of use, and ease of cleaning. After launching in the summer of 2009, their products sold out within 3 months. PlanetBoxes are available in two different “systems”: the Rover is for those who prefer a sampling of smaller servings of food, and the Launch is for those who want larger serving sizes. Each come with a colorful magnet set, perfect for personalizing with your current interests (think rockets, flowers, texting, etc.). Add-ons include Dipper sets, which are little compartments for wet/messy foods that can be placed inside the system. A Carry Bag is also an add-on that many people are fond of as the box fits securely within it and offers room for a drink, a pocket for another snack, etc. The Rover has five compartments and has room for two Dippers. It measures 10” x 7.5” x 1.5” and weighs 20 oz. The Launch holds 6.5 cups of food, is larger than the Rover, and is designed to hold a 3-course meal. It also comes with a Tall Dipper, which is great for dips/dressings. It’s measurements are 10.25: x 7.75” x 2”; weight is 22 oz. PlanetBoxes can be ordered on their website. Take one look at the product and it’s clear to see: The PlanetBox is the crème-de-la-crème when it comes to lunchboxes. The most unique of the bunch, the boxes are a sturdy high quality stainless which just gives a great feel. If you’re looking for a solid, unique method for sending lunches, this one’s for you. The quality and durability are obvious; this will last you for years to come, and it even comes with a one-year warranty (see package for details). Multi-talented Kelly Lester is the owner and creator of EasyLunchboxes. A singer and actress, she added entrepreneurship to her impressive resume when she sought to send her (three) daughters to school with simple, healthy food with little to no extra packaging or ingredients. The lunch container has three compartments and measures 9.38” x 6.1” x 2”. The large section fits 2.5 cups of food, the smaller ¾ cups and the smallest ½ cup. The containers are microwave, freezer and dishwasher safe and are made from BPA-free, FDA-approved, food-safe polypropylene plastic (#5). The containers are designed to fit into the EasyLunchboxes Lunch Bag (sold separately), a 9” x 6.5” x 6.5” bag that holds up to 3 containers/boxes. The boxes are not designed to be leak proof, which is why it’s suggested that they be carried upright in the Lunch Bags, which are created to keep the boxes stable (hence not letting the foods spill into other compartments). The lids are not “super tight fitting” so they are easy to open by little hands, as noted on the website. EasyLunchboxes can be ordered on Amazon. In all honesty, I truly had a tough time deciphering the differences between the Ziploc boxes and the EasyLunchboxes initially. However, the differences that I came up with are that the EasyLunchboxes’ tops are sturdier and they also come in fun colors. This may be a minor detail to some, but colors can be enticing AND helpful – especially when you are packing lunches for three of your four kids (in my case). No more hoping that you get the “right one”; it’s color-coordinating at its best. When it comes to durability, everyone uses his or her products differently. I know that I was able to use my two Ziploc boxes for a full year without having them crack or warp, but I also know others who weren’t as lucky. The EasyLunchboxes claim to have a longer durability, but also are not meant to last years. As far as the ease of opening, my kids found both the Ziploc and EasyLunchboxes to be fairly easy to open; if I had to choose one, they favored the Ziploc product but remember that they are used to them and have used them for quite some time. A negative for me personally is that the individual compartments are not sealed and I do often send wet foods (like yogurt, dips, hummus, etc.). On the flip side, I love that this is a mom-created business and always wish to support them! Jacqueline Linder is like many other moms: concerned for her children and looking to feed them the best, real food that she can. An ex-Apple exec, she already had years of creating innovative products under her belt. But after her kids were born, she sought healthy containers for healthy foods. Uninterested with plastic sandwich and snack baggies, she knew stainless steel was the ideal material. When she couldn’t find exactly what she wanted, she created it. What began as a company launched in a family garage has turned into a business that is changing lunches everyday. LunchBots serves up the highest quality (18/8) stainless steel containers in various sizes and styles. Choose from containers that have one, two, three or four compartments. The containers are sized 6” x 5” x 1.75” and weigh 9.6 oz; a larger one-serving unit measures 7” x 5.5” x 2”. Leak-proof containers can be added on for condiments or sauces and can fit snugly within the food containers. The material eases fears of toxins or linings coming in contact with your food, it’s 100% reusable and recyclable and the product is virtually break-free. LunchBots can be ordered on their website, and they are offering a special offer to readers of 100 Days of Real Food: Through noon PST on August 11, take 10% off of any of the products on www.lunchbots.com with the code 100DAYS. We’re so excited to be able to offer the discount as they don’t offer coupon codes through their website, so this is a great time to take advantage of it! Please note that shipping is also free in the US and Canada. I was introduced to LunchBots a few years ago and was recently anxious to try out their new and improved products. I love the look and feel of the containers. The lid comes on and off with ease; even my 3 ½ year-old can take it on and off. With different products with varying compartments, you can surely find one that fits your needs. I got the Duo, which has two compartments of similar sizes. I also got a Condiment Container, which is super cute and handy. My concerns on the LunchBots: spillage and size. The Trio would probably work best for my situation (I always pack four things for my kids – three for lunch and one for a snack. It’s funny how they get programmed for this and I get interrogated when there are only three things). With that being said, even with the Trio, I still need to pack one other item. The Quad is not quite big enough for me to get it all in, but I can make it work by including a piece of fruit on the side/etc. The LunchBots Bento Box Set is something I’d recommend, and I’d also recommend a Leak Proof Set to combat the spillage issue. I often times send hummus/yogurt/homemade applesauce in my kids’ lunches and find these to be a great option. With the add-ons available, the LunchBots are, in my opinion, a great option with a very reasonable price point. I love that they are stainless steel, they’ll last for years and are mom-made. I’m curious to hear your thoughts. 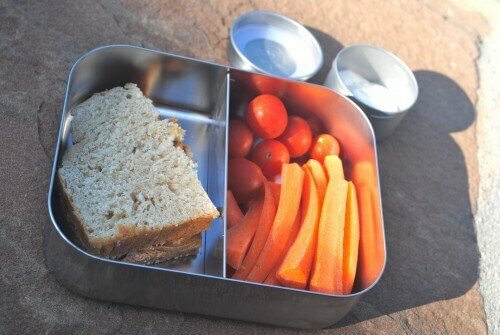 Do you pack your kids lunches each day? And what lunch boxes have been successful for you? does the planetbox fit into the Land’s end lunch box? i am trying to buy the landsend, want to know if the PBox fits in your experience…any advice? No it won’t fit – sorry! The planetbox is available with it’s own softsided case. My kids have used them for 3 years and they still look brand new. Definitely worth the money. Pottery barn kids now sells this with very cute holders and they can be personalized. Def worth checking out!!! I have 3 children, ages 6, 9, and 12. I’ve been using the same 4 ziploc divided containers for the past 3 school years with no warping, cracks, or leaking. I wash them in the top rack of the dishwasher most of the time but once in a while they have gone a cycle on the bottom. Thank you sooooo much for posting this. I have my first rising kindergartener and she wanted her lunch box to match her book bag and I wanted to use a divided container! We are going with the LL Bean flip-top lunch box. Now to decide between plastic and stainless . . . Looking for a good lunch container for myself. I often bring soups, stews, and salads to work and no matter what I’ve tried, the soup liquid and salad dressings leak through the seals. I want something lightweight, flat, stackable/space-saving, and single-compartment, not more than a 3-cup capacity. Thanks for all your reviews! I’ve decided to try Ziploc, since it fits what I want, with a variety of sizes and shapes. Lock&Lock looks like a good possibility too–a coworker just recommended that to me. I’ve always generally thought that the more expensive options must be the best but with lunch containers, I haven’t found that to be true. Kiran-what do you use to fit the Ziploc containers for your kids? I know what Lisa uses but I’m hoping to get something locally that I can pick up, not off the internet. In all honesty, it could be a bit bigger. If you can find the PBT one – it has great room in it. If you have a Sears store, they sell the Lands End boxes. Our Costco also had some lunch bags that fit the Ziplock containers, but they may be sold out depending on the location. I love the BOON lunch boxes, they are cheap a Khols. I paid $12 each after 20% and come in 2 cute designs for kids: elephant and ladybug. They seal great, no leakage and have 5 compartments, and are microwave and dishwasher safe. The only down side is they are not stackable. I have 5 of the elephant, and pack them in advance for my sons daycare. I personally use the ziploc for myself at work. Is the Ziploc Divided Containers only available online? I couldn’t find these at my local Wal-Mart? Chas-I found these at Target yesterday. You can go online an check to see if they carry it at your local store, just type in your zip code. The ziploc containers had coupons on them, $1 off 2 ziploc containers, so make sure you look around and grab one. We’ve used the Lunch Bots for a few years, and I love them for their longevity, earth-friendliness, and healthiness. My only complain about them is that the compartments are not sealed from each other – even when laying flat on a table. This means that if you cut up fruit or cucumbers for one side, the sandwich gets wet by lunch time. This has meant that we’ve had to pack two – dry and wet – or put fruit separately. This in itself poses a problem since the metal container will bruise any fruit that is in the same lunch bag. I now have plastic containers about the size of a dry-measure cup to hold uncut fruit. We also just added PlanetBoxes to our cadre of solutions. I like them a lot. They’re a bit more leak proof (between sections). We have all the accessories too: ice pack, bag, fork and spoon, big and little dipper. My kids love them. They are heavy, especially when you put a water bottle in the pouch. Another vote for laptop lunches. My daughter is moving into 5 years with hers. For those who complained about losing parts, they make it very easy to buy replacement pieces and they are not expensive. They also come with a stainless steel utensil set, which has its own compartment. That cuts down on lost forks in my experience. I have their thermos as well, for hot foods, and we are pleased with it too. I see my daughter using the same set (well, we have two now so one can be in the dishwasher) for her entire school career! I loved this post. Im trying to decide on the plantet box vs. the lunch bots for a kindergartener. I’d love any input. Thank you!!! Mara – you can’t go wrong with either. The LunchBots are a great size and very durable. I use them daily for two of my kids. The PlanetBox will get LOTS of years of wear and buying it for your Kindergartener would mean you’d have it for years to come. Really – I truly love both. thank you, kiran, for such a fast response! I also love both the PlanetBox and LunchBots. I find the PlanetBox great for days you need to send a full lunch and LunchBots when you only need to send a snack. If you add a thermos to either, you have enough food to get my hungry 2nd grade son through the day! I am a huge fan of the Rubbermaid LunchBlox. It comes with a sandwich box, a rectangular box, and two small square boxes with an ice pack that snaps in the middle. It’s BPA free. They are also spill proof. You can buy extra pieces and mix and match as needed. It also clicks together in a small space that is perfect for staying upright in the lunch box. I’ve been thinking about buying more little small squares for making jello snacks ahead of time. Thanks for the reviews! After reading this post I just ordered PlanetBox sets for my twins, who will be starting pre-school. Pricey but worth it if it makes the daily lunch packing grind easier. I also love that they have a meal planning app. Figuring out healthy, fun meals to pack EVERY SINGLE DAY is the hardest part for me. The idea of filling up each compartment and-voila!-I’m done is appealing to me. Thanks again! Love 100 Days! PS We also have several LunchBots containers that we’ve used for 2+ years and have been really happy with. I bought a Yumbox which is plastic and expensive $38. I wish I would have known about the Planetbox since it’s stainless steel. As a preschool teacher and mom of school-ages, I found the Planetbox system difficult since items that need heating need to be removed…time consuming for a teacher heating multiple lunches. It is great for a school-ager, but the bag is big and heavy. Another option that I like is the Rubbermaid LunchBlox System. They are about $10.00 and I found them at Target and Safeway. We’ve had ours for two years so far. I like that items can be separated. The BPA-free containers. They are microwave- and freezer-safe; your food stays chilled with snap-in, Blue Ice inserts. Top Rack Only, Dishwasher-safe, Clean with Water and Mild Soap. For hot items I use a good-ol stainless steel thermos. For lunchboxes, I found the Built lunch bag. I LOVE that I can wash them and I can fit lots of stuff inside. We’ve had the same bags for three years. Can you please provide some options for lunch boxes that fit the ziplock containers in them? For kids and adults? I purchased 3 Planet Lunch lunchboxes in September based on the reviews here, from Pottery Barn Kids. The bag lasted 2 months and Pottery Barn’s response was to offer me a 15% discount to order another $70 lunch box. Beware!! For those who are wondering about lunch boxes for the ziploc containers, we LOVE the byob bags at target. They are stretchy neoprene bags that allow you to carry the container flat. Also, they stack flat in the cupboard and wash well in the machine. I can fit in the ziploc lunch and 2 snack containers, kleen kanteen small water bottle and an ice pack. Target carries them year round, but has cuter patterns at back to school time. Can you tell me if the PlanetBox sets fit in the LandsEnd softsided lunch box? Thinking of purchasingbut want to ensure that the kids can use their backpack matching lunchbox they have already ordered for school. We have the lunchbot regular and the new larger size. Do they fit in the pottery barn classic lunch box? I have been searching for a good lunch box for my kids for a few years now. Each year I give up and buy something locally. But they all end up cracking. I have had my eye on the planetbox for a bit now. The price is pulling my away. Ughhh. I bought a planet boxes 6 years ago for my kids. I have replaced their fabric covers twice in that time. $70 over the course of 6 years is pretty darn cheap! I am deseparately trying to find a way to pack cold and hot foods in the same lunch bag. The thermos is too big for my 4 year old. If the thermos is on the table and he’s seated in his chair, he cannot see inside the thermos. Only options I have found are the Lunchbots 160z insulated thermal and the Klean Kanteen Vacuum insulated food canister. Are there any other hot food storage containers I could include in his lunch bag? When I pack only cold items, I use the Planet Box Rover. PlanetBox is a great idea but didn’t work for us AT ALL. Wish I had saved the money. Since his lunch box had to hang in the cubby all day, the food leaked…I’m not talking about applesauce, I mean even the nut butter sandwiches leaked all over the outer box…which isn’t even washable. It got nasty and just goes unused now. ALSO THE OUTER BOX ISN’T EVEN INSULATED. THAT’S JUST WRONG! I currently use the Planet Box to send lunch and snack to school with my 20 month old. I don’t have a dishwasher and having only 1 container to wash is so easy. The thermos funtainer and thermos foogo each fit in the drink pocket. I pack 2 napkins, a bib, skip hop toddler silverware as well as the tray in the bag and use the outside pocket to hold a piece of fruit and a granola bar or similar for snack. My child prefers cold to room temp food and her food stays chilled all day with the Planet Box ice pack. I can lay a Sili Squeeze reusable pouch between the tray and zip pack and still zip the bag. Wondering if the ice pop molds would fit there too. Love the Sili Squeeze and it should make the list. I’ve been looking into the lunchbot containers. Does anyone know if these will keep a hot sandwich hot until lunch time? My daughter (16) prefers hot sandwiches (grilled cheese, ham and cheese, etc.) and wants a sandwich container will keep her hot sandwich hot. What Amy (above) says is correct – though I will say that I have a friend who packs hot sandwiches (cuts them in half and puts them in a thermos) and they stay hot until lunch. So it could be worth a try! Please scratch that ^^ found them at Walmart.com for near $5, phew! I’m trying this kickstarter to see if it’s the answer to my needs for my daughter’s lunchbox issues! I live in England and would like to get some of these boxes. Anyone know where i can get them over here? I know this is an old post, but is LunchBots offering the discount this time around too? I’ve been looking for something easy for my 3 1/2 year old to open, that also will fit in his lunch bag (pottery barn kids classic lunch bag). I love the ziploc containers and can cram it in his bag, but I think a LunchBot will fit more easily. So sorry, Melanie; that was a one-time deal. They very rarely offer discounts, unfortunately. But I will say that I have LOVED using these for my preschoolers lunches (and also use their new larger versions for my bigger kids). Hope this helps! It does help! I’ve been eyeing them for a couple of weeks online. You’ve convinced me to give them a try for my son. Thank you! And thank you for the great, personal, input! It’s nice to have feedback specific to preschoolers since their fine motor skills are still very different, even compared to a kindergartener. Oh good!! You are so welcome – glad to help;). We have planet box but check out omiebox! Has both space for hot and cold food and kid friendly lid! I have used Planet Box lunch kits for 4 years now with both my sons. I love the fact that I just have two rather compact containers to store instead of all the various sizes and lids of other systems. The best thing about Planet Box is that the lid is attached to the bottom so i NEVER have to go looking for a matching lid. They hand wash very easily, but occasionally I do put them in the dishwasher. When they are stored vertically with food in them, things can get a bit messy, as the compartments are not sealed from each other. I just ask that the boys take them out of their backpacks and place them on a shelf above their backpacks at school and all is good. The dipper add on is great too, and the bag that you can get is a must. It is somehwhat insulated and has a compartment for an ice pack as well ans exterior pockets for water bottle and extra snacks. It is pricey but has lasted 4 years and seems like it could last right through grade 12. Sorry if this has been asked before but the ziplock containers are leak proof but the easy lunch box containers are not correct? I use some square snapware boxes we got really cheaply a few years ago. They do great in the dishwasher. Inside those I use 2-4 silicone cupcake molds as needed to fit other little foods. Not leakproof, but I don’t pack wet stuff. I have the silicone Popsicle molds for yogurt and applesauce, but they spilled all over my kids lunch boxes as their waterbottles popped the top off of them. My kids have the LLBean critter lunchboxes because they match their backpacks. One is gonna be on it’s 4th year with no problems at all. For drinks we use the 12oz. Thinksport stainless steel waterbottles and LOVE them!! It is awful. I’m returning mine. It’s hand wash only (despite he web description) and does not seal against liquids or between compartments. For the money, buy a planet box. I love love love my daughters Planetbox I guess I’m a compartmental person because it makes it much easier for me to pack her lunches. She loves it too although the weight of it may become an issue for middle school and a heavier non rolling backpack. We’ll see. She’s had it for two yrs and it’s been great! The magnets even go through the dishwasher as daddy never takes them off before putting it in there. No hunting for containers anymore and no plastic! I recently purchased a trio large Lunchbot and love it too for lunches on the go. We had older Lands End lunch boxes laying around and I just pop my Lunchbot in one and away I go. Above it says that the Ziploc divided containers are about $5.14 for a set of two, but when I click the amazon link it comes up as $24.98 for a set of two. Where do you buy them for cheaper? That seems like a lot of money for ziploc plastic containers! This post was great, thank you!! I purchased the 5 compartment Planetbox (Rover) for my son upon entering Kindergarten in 2012. I was looking for durability and wanted to eliminate the need for plastic baggies. So far, I love this product. It is pricey for a lunchbox but I plan for my son to use it for years to come. The carry case for the Rover provides extra storage capacity as mentioned in the review. It allows room for a snack and a pocket for a Thermos. Most recently I also purchased the 3 compartment (Launch) just to have an extra lunch bag for trips to the park since I now have a second child. The carry bag for the Launch is not as kid friendly as the zipper does not go all the way around the bag as it does for the Rover. This makes it a little harder for a child get their Planetbox out. Launch may be intended more for adults as it does have a larger storage capacity. Also, Planetbox does offer a freezer pack made of plain water that fits inside the carry case Overall, I would definitely recommend the Rover for a younger school age child. For those of you who have been looking at the Ziplock containers I just recently found 2 packs at our local Target for less then $3. They have worked great for us and they seal nicely without leaking in-between compartments. I really wanted to try the Planetbox but that is an investment that may be later to come. Also I love the magnet idea to give the lunchbox some character and recently discovered Mellissa & Doug Magnets for around 3-4 dollars that you can choose from a large assortment of animal characters or numbers and letters. 2. If you are putting the Thermos cup inside which I tried it works but, it does not if I add a hard ice brick. Even a thin one. So that leads my to question 3. 3. Are the ice packs you have recommended that are little cubes together on a sheet, flexible enough to place them in the box with a Thermos and close it easily? 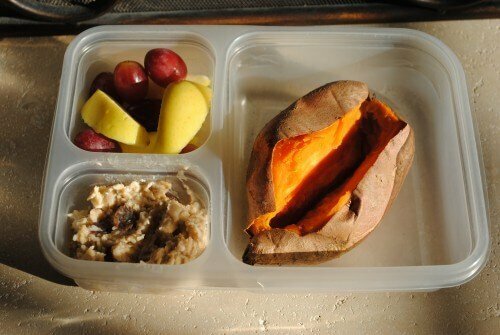 I finally saw a picture of a packed ziplock divided container lunch with Thermos on Lunch Round up V and yes I se the Thermos is on the outside. Kind of bummed my Kindergartener has a HARD time getting his Thermos in to the outside holder. I think for more room I am going to purchase a Bento Box so the Thermos can go inside. Pottery Barn does sell PlanetBox – but I just looked on their site and they said “no longer available”. Hope this helps! Where are the “yumbox” reviews? I just bought 3 because you promote them on your website! I hope my investment was worth it! Thank you for all of your research, I know I can count on you! This post was created before Yumboxes were introduced to the market. With that being said – an updated lunchbox gear post is in the works, and they will definitely be included! I am confident that you will be happy with your purchase:). Do you know when the updated lunchbox gear post will be available? Thanks. It’s on my list – look for it in the next 2-3 weeks! Hi am feeling confused about the LunchBots Lisa is recommending. She said she recommends a Leak Proof Set as well (which is highlighted) because she sends apple sauce hummus ect. Now the actual leak proof set is small containers, with leak proof lids BUT my question is did she mean a set of the little condiment like containers that are leak proof? The apple sauce or hummus ect. would spill all over inside the other food inside even the leakproof container. You are correct. The LunchBots are not leak-proof, but the smaller containers are. We generally send wet ingredients in the smaller containers along with the regular LunchBots containers. Just FYI the amazon.com link for the ziploc containers is pretty pricey! $22 for two containers. It may be that they have sold out of their stock with your link :). But target is priced at $2.99. Maybe put general cost estimates in the new lunchbox review? Just a suggestion. Thanks so much for all of the great info!!! Oops! Just saw the other comments. Nevermind! My experience with customer service of PlanetBoxes has been great; I’d suggest reaching out to them and asking for their input. Hi. I would love your thoughts on the Pottery Barn Kids stainless lunch set (called “all-in-one” and has a bento-style, single stainless piece with multiple compartments and comes with an insulated bag). Also, I can’t seem to find the updated lunchbox review that is mentioned, above. Any help with those items would be appreciated. Thanks! I am sorry, but I have not personally tried out the PBK “all-in-one”. I can’t speak intelligently about it for that reason. Sorry I cannot help!! My six year daughter recently started using the PBK all in one and without any prompting from me she told me she loves it and never wants to use her other lunch boxes again. She says it is easy to open and she likes that everything is in one container – I was previously using separate lunchbot and kids konserve containers (which I now use for my own lunch). I am very happy with the quality and have had no spillage issues. I was afraid to try it because of the hefty price tag but am very satisfied. Hope this helps. Courtney, with the PBK all-in-one box, will juices (like with cut up pineapple or strawberries) leak from one compartment to another? Now that she has been using it for a few months, I do notice some leakage, but not from one compartment to another, just from the stainless steel container to the bottom of the fabric bag. It was pretty easy to clean. However I don’t pack many “juicy” or liquidy items either. How do you carry the lunchbots in he lunchboxes? Laying flat or are you able to carry it upright like in a regular kids lunchbox? I bought it and had to return it because EVERY SINGLE DAY my daughter’s lunchbot would open and spill all of her lunch in her lunch box before lunch time! So frustrating! My preschoolers were carrying them in a lunchbox that was sometimes flat, but sometimes not. And my older ones have used the (newer) larger sizes; I tell them to try to keep them flat if/when possible. I (knock wood) have never had an issues with spillage; I am sorry that you did! I love the Easy lunch boxes. I use them for myself for work and manage to pack 4 days worth of lunches on one day. This knocks out almost an entire week of lunch packing for me. I found them very sturdy and I liked the colors a lot. I didn’t find any problems with wet lunches such as soups but I am also not a kid who tosses their food around a lot. I did put smaller containers inside the larger compartment however for dips and salad dressing. Has there been an updated school lunch supply list? Specifically looking for recommendations for lunch boxes that will work with a variety of containers for lunch as well as a separate compartment for a snack that my rising kindergartner will need to take. Thanks, in advance!! Hi there. 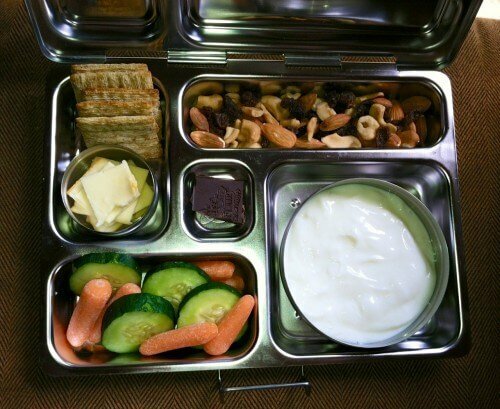 This was the latest: https://www.100daysofrealfood.com/2015/08/07/review-favorite-lunchboxes-for-kids/. Do you love home food even when you are in office? Nothing can actually beat the feeling of having home-made parathas, pulao, sabzi, paneer and more when you are hungry during the lunch time at office. Home food is not just delicious when it comes to taste, but also healthy when compared to junk food outside. Have a nice lunch with your team at office and share your delicious food with them as well. Buy yourself a sturdy lunch box from Amazon.in and enjoy amazing deals and discounts. It is unreal how expensive stainless steel products are in the States. I have spent five of the last ten years of my life in India, where stainless steel products are everywhere and dirt cheap. It is sad they are so rare and expensive in the US. I wish America wasn’t so addicted to plastic! I love the stainless steel lunch boxes but the price is crazy!